We’d love your help. Let us know what’s wrong with this preview of Green Lantern by Ron Marz. Kyle Rayner is the last Green Lantern. After Hal Jordan's campaign of terror on the Green Lantern Corps, Ganthet, the lone surviving Guardian, bequeathed Kyle the final power ring. 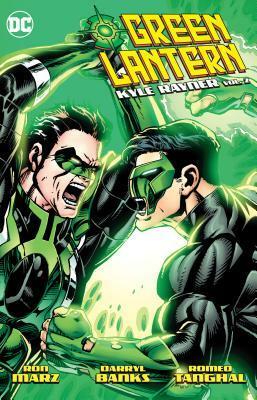 The ring and legacy of the Corps now live on with Kyle Rayner. Defending the Earth on countless occasions and saving the universe from Hal Jordan, Kyle has earned his place among the greatest Gr Kyle Rayner is the last Green Lantern. After Hal Jordan's campaign of terror on the Green Lantern Corps, Ganthet, the lone surviving Guardian, bequeathed Kyle the final power ring. The ring and legacy of the Corps now live on with Kyle Rayner. Defending the Earth on countless occasions and saving the universe from Hal Jordan, Kyle has earned his place among the greatest Green Lanterns. However, Hal Jordan has returned. Refusing to accept responsibility for his actions, Hal looks to reclaim his mantle as the Green Lantern. With his sights set on Kyle Rayner's power ring, Hal will take it back by any means necessary. The core GL issues are actually pretty great, especially Parralax's return. The book does get bogged down with the two crossovers though. 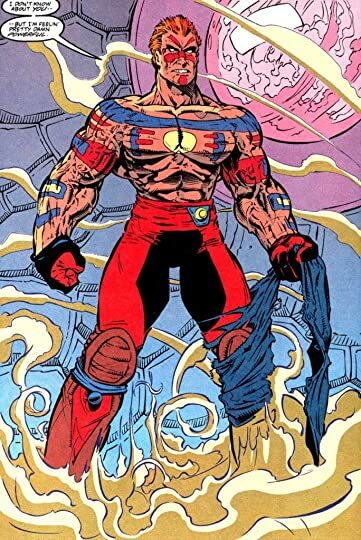 Boy, what a travesty that Guy Gardner, Warrior series was. What an awfulidea to turn him into an alien with shapeshifting powers. And that costume design, Yikes! It looks like he's dressing up in warpaint and running around as a Native American. I can just see the outcry if DC tried that today. Then there's the New Titans crossover. This was when DC made the te The core GL issues are actually pretty great, especially Parralax's return. The book does get bogged down with the two crossovers though. Boy, what a travesty that Guy Gardner, Warrior series was. What an awfulidea to turn him into an alien with shapeshifting powers. And that costume design, Yikes! It looks like he's dressing up in warpaint and running around as a Native American. I can just see the outcry if DC tried that today. Like the first volume, this one’s weaknesses mostly lie in the crossover issues. There’s a five-part crossover arc at the end between GL, New Titans, Darkstars, and Damage, and it was so boring. So, so boring. I didn’t even read the last two issues. The rest of the book was decent enough, though. Very cheesy, but that’s just what to expect out of something from the mid 90s. I hate to rate this 3 stars, because the actual Green Lantern series collected here is very entertaining (especially the "Parallax View" two-parter, a long-time favorite of mine), but the issues from other series really bring it down. There is a ton of '90s comics nostalgia here, but not all of it holds up. Marz is well known for his work on Silver Surfer and Green Lantern, as well as the Marvel vs DC crossover and Batman/Aliens. He also worked on the CrossGen Comics series Scion, Mystic, Sojourn, and The Path. At Dark Horse Comics he created Samurai: Heaven and Earth and various Star Wars comics. He has also done work for Devil’s Due Publishing’s Aftermath line, namely Blade of Kumori. In 1995, he h Marz is well known for his work on Silver Surfer and Green Lantern, as well as the Marvel vs DC crossover and Batman/Aliens. He also worked on the CrossGen Comics series Scion, Mystic, Sojourn, and The Path. At Dark Horse Comics he created Samurai: Heaven and Earth and various Star Wars comics. He has also done work for Devil’s Due Publishing’s Aftermath line, namely Blade of Kumori. In 1995, he had a brief run on XO-Manowar, for Valiant Comics.